Since 2017, Singapore has been gradually initiating a cashless drive. It started with the Monetary Authority of Singapore deciding to roll out a common Singapore Quick Response Code (SG QR) sometime in 2018. It was to be adopted by payment service providers all across the country. It was also in 2017 that seven banks in Singapore decided to allow customers to pay using NETS (Network for Electronic Transfer) QR Codes. For those who don’t know, NETS is Singapore’s national debit scheme that allows customers to make payments using their mobile phones or ATM Cards. In Singapore, Small and Medium Enterprises (SMEs) constitute 99% of all the businesses. Of these, cash payments make up nearly 60% of all transactions. This is because for street vendors, food stalls, hawkers, and market vendors, installing POS (Point-of-Sale) terminals is a rather costly experience. 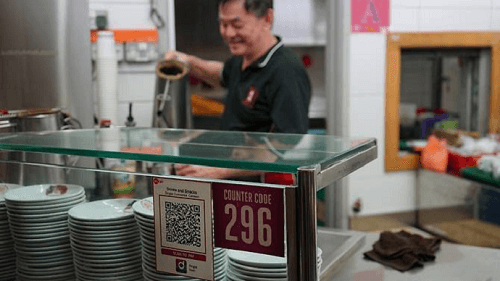 To encourage cashless transactions, the Singapore government decided to bring in QR Code-based payments. What Role are Banks Playing? Banks and payment service providers have committed themselves to update their mobile payment apps to help consumers read the SG QR Code. NETS QR Codes developed by banks will be made a part of SG QR Code. The latter accepts both national and international payments and will help consumers make payments irrespective of the platform being used. SG WR Codes will gradually replace NETS QR Codes in 2018. Association of Banks in Singapore have also come up with a P2P (Peer-to-Peer) banking service named PayNow. It will facilitate the direct transfer of funds without the need for any bank to act as an intermediary. Have other Countries Made Similar Changes? China has heavily invested in QR Code-based payment methods. Some of the payment platforms which, use QR Code-based payment method include AliPay and WeChatPay. All small vendors accept QR Code-based cashless payments. In Asia, where SMEs constitute 98% of the market, affordable payment methods are the need of the hour. Apart from China, India also took a number of such initiatives. These include UPI (Universal Payments Interface) such as BHIM, Tez and Paytm. One can make payments using both QR Codes or a mobile number. They rule out the need for any financial institution to act as an intermediary. All of them are free to use for making and receiving payments. Cashless payment methods make shopping more convenient. They rule out the need to carry cash or tender the exact change. It will be interesting to see how quickly Singapore adopts and it and how successful QR Code-based payment methods turn out to be.